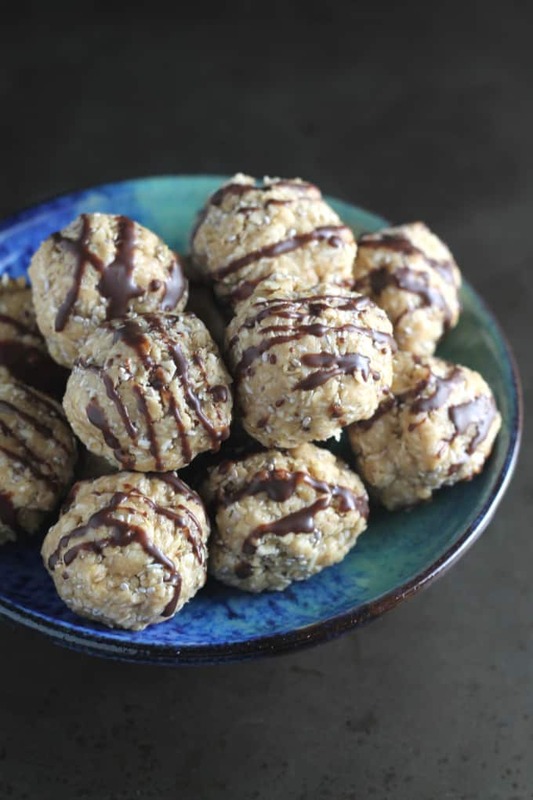 An easy no bake recipe for gluten free energy bites made with oats, nut butter and chia seeds. My oh my today’s recipe is something special! I don’t want to blow my own trumpet but I have to say I am very proud of this concoction. 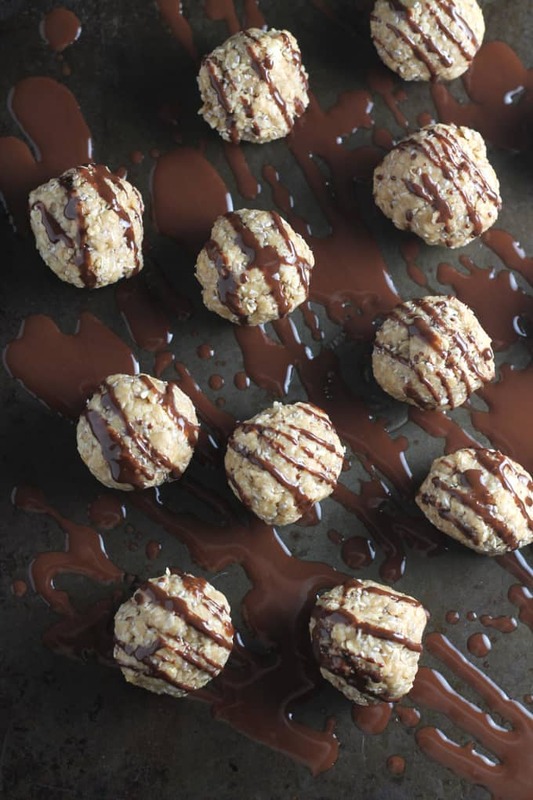 After an indulgent Christmas break snacking on all the wrong things I wanted to come up with a quick and easy snack that would stop me reaching for those leftover chocolate coins… and so the No Bake Chia Energy Bite was born! These bites are ridiculously easy to make. As the title states they require no baking. Simply mix the ingredients in a bowl, chill for a few minutes in the fridge and then drizzle with a little melted chocolate. They will keep in the fridge for several days and are so versatile. 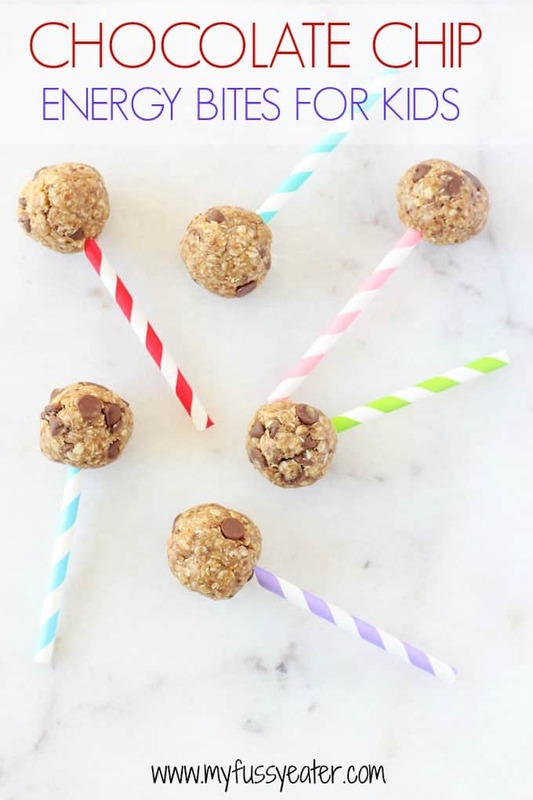 Take a couple to work as a snack to beat that mid-afternoon slump… pop a few into your gym bag as a post-workout snack… put one into the kids’ lunch box as a healthy treat… you can even eat them as a grab-and-go breakfast on busy mornings. Not only do these little bites of heaven taste amazing, they are also super healthy too. The oats, nut butter and chia seeds provide a natural slow releasing energy boost with lots of protein to keep you full until your next meal. I used a mix of peanut butter and cashew nut butter in my recipe but you could also use almond butter or hazelnut butter, depending on your preference. You can also add some additional ingredients such as raisins, other dried fruit or chocolate chips. I opted for a drizzle of dark chocolate to keep them healthy yet very tempting! I hope you enjoy them as much as I do. Please do let me know if you try this recipe. I would love some feedback! Mix the oats, nut butter, honey, coconut, chia seeds and vanilla extract together in a bowl until fully combined. Roll the mixture into equal size bites. 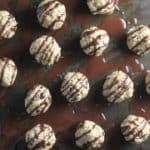 I made 15 bites from my mixture but you can make more or less depending on what size you want them to be. Place the bites in the fridge to firm up. Melt the chocolate in the microwave or in a double boiler (just be sure not to burn it!). 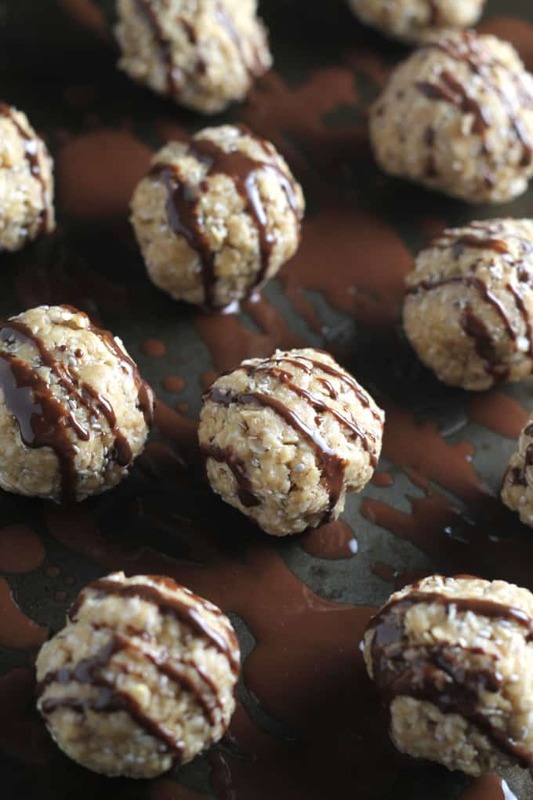 Drizzle the chocolate onto the bites and return them to the fridge for another couple of minutes. What can I substitute for the oats? I have a severe sensitivity to oats. This recipe relies on the oats. 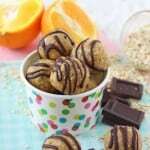 However there’s loads of other energy bite recipes online that uses dates as the main ingredient. i make these for myself as a healthier snack alternative. so easy to make and they taste great. Super easy and great to have on hand as a snack for the kids after school. Very good! My 2 year old and 4 year old love them as well! Easy and healthy! Brilliant! Thanks for letting me know! Hi Amber, I’m so glad you enjoyed the recipe. These energy bites are one of my favourite snacks! Hey I was considering to substitute the coconut with flaxseed. I’ll let you know how it pans out!!! Flaxseed works really well in these bites! Hi! I’m new to the chia seed world and I heard you should soak them. For this recipe, does it call for soaking the chia seeds before hand? Or are you supposed to use them as is? Hi, I don’t soak them. I use them as they are, dried. For this recipe you can use any cup or mug as a measurement, just use the same mug to measure all the ingredients if that makes sense! What type of honey did you use?? I have both pasteurized and unpasteurized. Would I still use 3 tbsp if using unpasteurized? Thanks! Hi Hailey. You could try starting with just half the amount and then taste it to see if it needs more. Thank you so much. So glad you enjoyed them. The cranberries sound like a delicious addition! Hi! Thanks for all your fabulous recipes! 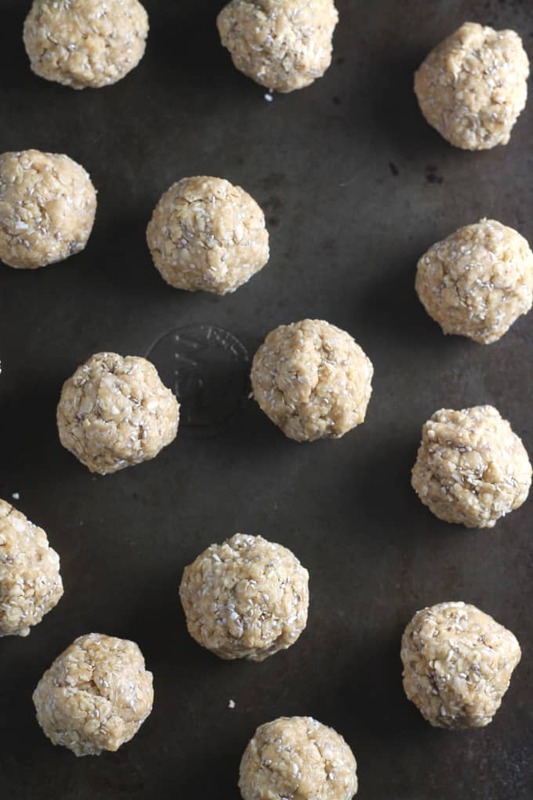 Just wanted to ask, I’ve seen a lot of recipes use Rolled Oats, but all I can find are the Instant Quaker ones,will those do? Also, I always thought you had to cook them before eating..isn’t that so? Have never made a recipe with uncooked oats.So just wondering. Lastly, can Chia seeds be eaten without keeping them over-night to soak? Wont they be hard? Sorry for so many questions! But I really want to make them asap! So looking forward to your reply! Hi Megha, I’m in the UK so I can’t say for sure but I think those Instant Quaker Oats are the same as rolled oats. They don’t need to be cooked You can soak them in milk and yogurt to make overnight oats. Or mix them with ingredients such as nut butter in this recipe. They will soak up some of the nut butter and become more soft. They are delicious, trust me! And yes, chia seeds can also be eaten without being soaked. They give the tiniest of crunch to recipes but you barely notice the texture in this recipe. I know this was posted months ago, but I just made these and they are incredible!! So easy, and so addictive, but they are pretty healthy so who cares! I didn’t use any chocolate (which is a miracle for me) but did put in some peanut butter chips for a bit of a crunch and they were great. Even the picky boyfriend who hates anything “healthy” loved these and requested a second batch. Thanks for the recipe!! Thanks so much for letting me know Emma. And I love to hear how people have changed the recipe according to their tastes. The peanut butter chips sounds incredible. I need to try them! I made these last night and had a few for breakfast. Very filling and delicious. So glad you liked them. And a great idea to have them for breakfast too! 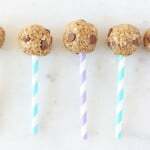 These look like the perfect snack to take to our moms’ meeting in the park tomorrow! Thanks for sharing your recipe! Thanks Fina. So glad you liked them! Amazing!!! Thanks for coming back and letting me know Anna! Delicious! I used sesame seed butter (tahini) and these are wonderful! Oh yum! I bet they are amazing with tahini! WOW! These were so yummy. I ordered chia seeds to try. I’d never had them before. They got here today and a quick pinterest search led me right to your recipe. i wanted something quick and easy using ingredients I already had. I was brave enough to let my toddler help pull them together. When I let her lick the spoon and she said “more more”. Even my husband loved them. Thanks so much for sharing. I’m sure we will be making these again and again. Hi Krysten, thanks so much for your lovely comments. Its always so nice to hear from people who enjoy my recipes. Glad the whole family like the energy bites. They are a big hit with my lot too! i love this idea! i didn’t have any honey so i used 2 tsp of almond milk to get it to stick. also used almond butter and chocolate PB2 rehydrated with almond milk since the kids ate all the pb 🙂 these were awesome!! Do you know calorie count by any chance? These are delicious! The only problem is I want to eat them all! Ha ha! That is a problem alright! I had to keep them in a double sealed lunch box container in the fridge so I wouldn’t pick at them constantly! They would indeed. Thanks Elizabeth! Thanks Rebecca. Let me know what you think! These were very easy to pull together. I used a walnut butter I’d made with some cinnamon and salt, which were nice counterparts to the vanilla and honey. Still, I had a hard time keeping the balls together – they kept wanting to crumble. I added a little coconut oil and that might have helped. Next time I’ll either omit the shredded coconut or toast it because I didn’t notice it in these. Oh yum, walnut butter sounds so good! But if it is drier than other nut butters then perhaps thats the reason the balls kept crumbling. I thought that the coconut made the bites super sweet but then I’m coconut obsessed so maybe it’s just me! Nom nommmmm gimme all the chocolate! Ha ha, it’s only a drizzle to keep them super healthy!! 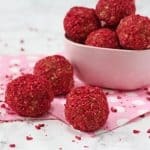 I regularly have power balls like these on hand for whenever I want a healthy little snack.. so this is an ideal recipe for me. Thanks for sharing it, they look delicious! Thanks Thalia. I need to experiment with more flavours. I’ve loved having them in the fridge to snack on this week! Love love this idea!! Look so delicious! I am all over this recipe. Making soon, pinned!